The middle school years, ages 11-14, are extremely important in the development of your child. These are the years when talents are often identified and strengths can begin to be nourished. However, it cannot be denied that the transition into a middle school boarding school at this age can also be a challenge. This is why sending your child to summer school in preparation for attending year-round Middle School is a wise idea. "I spent 6 weeks at the Summer Course before joining the school as a boarding student in September. This helped me when I started full time because I already knew the rules and expectations; I had gotten to know the Brillantmont "way of life" even if things are a bit different during the school year." Through the Brillantmont Middle School programme, students are prepared to excel in either American or British high school. Whether you want your child to succeed in a program teaching A-levels, or an I-B program, Brillantmont is the ideal place to build your child’s learning foundation. 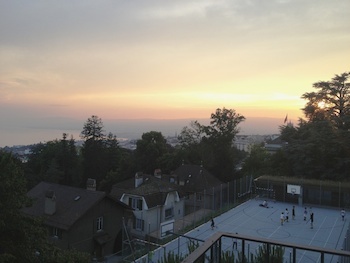 With our unique, small class sizes and our location on an intimate campus in a residential area of the culturally-rich city of Lausanne, students are able to discover and foster their strengths for future success. The close connections to staff and teachers developed during the summer school continue to grow in this close-knit community. One area that parents are often concerned about as their child develops is language learning. Middle school is a crucial time for students to make large leaps in their linguistic abilities and even begin new languages before it becomes more challenging as they grow older. "The Summer Course helped me improve my English and then gave me confidence when speaking to my teachers and peers in middle school,” says Margarita about her transition. This intensive language programme, a total immersion with English and French, continues during the school year and thus allows for uninterrupted learning year-round. At Brillantmont we teach in English and offer intensive French courses - 2 hours a day - as well as Italian, Spanish, and German. Parents can be reassured that in these important years, their child’s language abilities are being encouraged and stimulated so that as they rise into more advanced levels in secondary school or high school, they are in a position to easily succeed. In addition, through our EAL (English as an Additional Language) programme, we make special provisions for students who are in need of developing their English skills in conjunction with the rest of their academic programme. By getting a head start in summer school, students can place into higher levels of EAL and thus make the transition into full English course loads easier. Brillantmont is still run by the family that founded it in 1882, something quite unique among Swiss boarding schools. Every new student gets welcomed into this Brillantmont family. It is very important to us that we offer a welcoming community where students are able to find a sense of home away from home. The small size of the school, 150 students, also helps immensely with community building both in the summers course and throughout the school year. Students feel a lot closer to their teachers, administrators, and peers than if they were at a larger institution. It is also because of our unique size that we are able to provide a very safe environment for our students. Whether on our school grounds, enjoying outdoor activities nearby such as hiking or skiing, or taking an excursion to one of the diverse cultural museums or historical sites around Switzerland, it is our staffs’ highest priority to maintain the security of the children. By first attending summer school, making connections with the staff and teachers, becoming familiar with the campus and environment in Switzerland, and getting a head start on English and other language learning, we have found that students are able to make a smooth transition into middle school. Give the Brillantmont way of life a try! Register now for summer school 2014!